“Que es un sopa de feo, hoy?”, I ask in my stilted Spanish, feeling quite proud of myself! Maxima and Maria give each other a sideways glance and a little roll of the eyes. It takes me a minute, but I finally clue into my mistake. I have asked the cooks if the soup is ugly-feo-, instead of asking if the soup has pasta- fideo- in it! 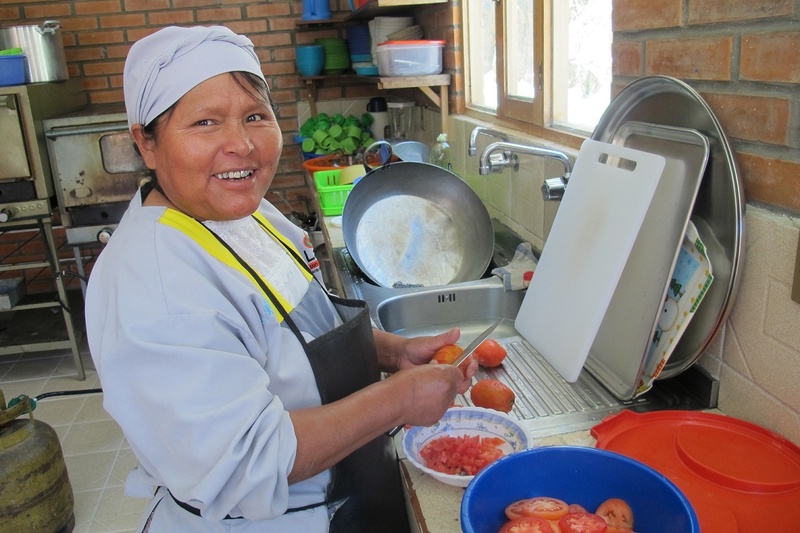 And so goes another day working in the kitchen as Up Close Bolivia volunteers at the Valle de la Luna pre-school in Mallasa, Bolivia. For the past month, Doug and I have been volunteering at the pre-school, me in the kitchen and, occasionally, in the classroom and Doug building a greenhouse. Each day left us feeling inspired, happy, confused (mostly me!) well-fed and completely exhausted! It seems that everyone blames their ailments on the altitude, so we like to think that this is the reason for the exhaustion and not because we are a couple of light-weights! 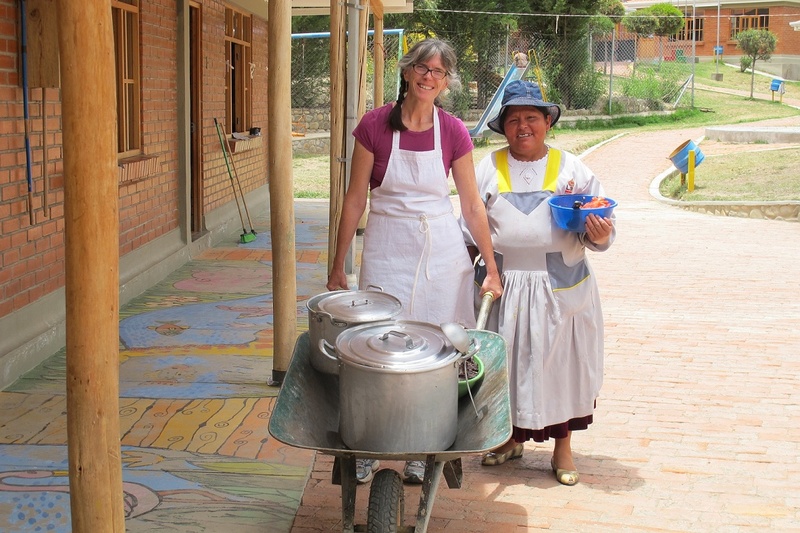 From Monday to Friday, I prepared the vegetables, washed dishes and served lunch (delivered in a wheelbarrow!) to 80 pre-schoolers alongside Maxima, the head cook and her assistant, Maria. Being Aymara, the largest indigenous population in Bolivia, both women have waist-length hair braided and tied together with a single ribbon, wear traditional hooped skirts, known as polleras that are often velvet or brocade, on top of layers of lace under-skirts, brightly patterned aprons and adorable flat shoes, often in different shades of patented leather. Once things get going in the kitchen, they both don headscarves and an official kitchen smock. But don’t let their beautiful clothing give you the impression that they aren’t cut out for kitchen work. 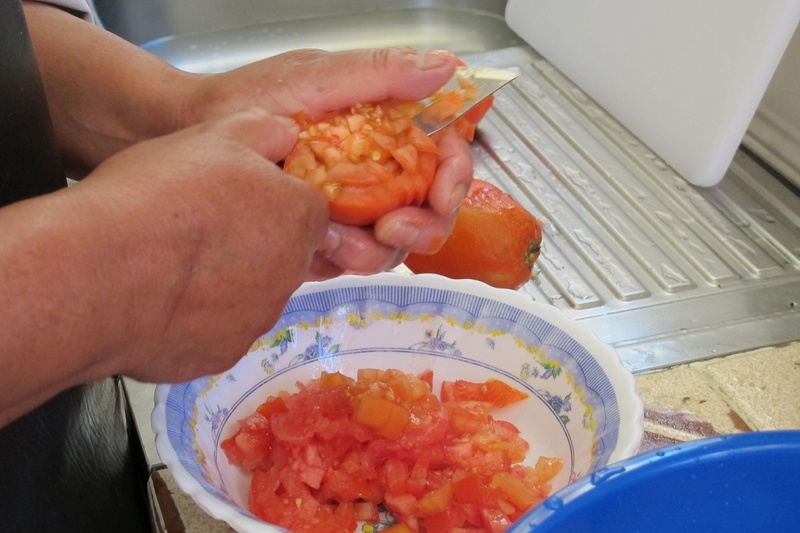 Both women can finely dice a tomato in their hand in 10 seconds, haul 30 L pots of soup, single-handedly (did I mention that they are both tiny?) , and skin, trim, and portion a beef liver into razor-thin slices in a flash. 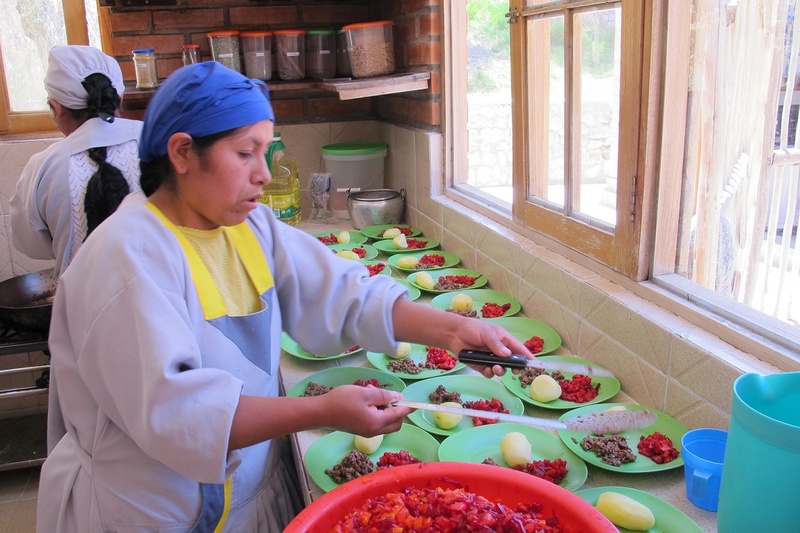 After thirty years of working as a chef, almost twenty of those years teaching professional cooking, I was humbled- and forced to rethink some of the “professional” skills I had been teaching- by these women every day. How often had I told my students, “never, ever, cut without using a cutting board?” With no cutting board in sight, Maxima and Maria would fly through a stack of carrots with a small, slightly dull, 10 Boliviano ($1.25) knife, miles faster than I ever could have done using an expensive French knife. 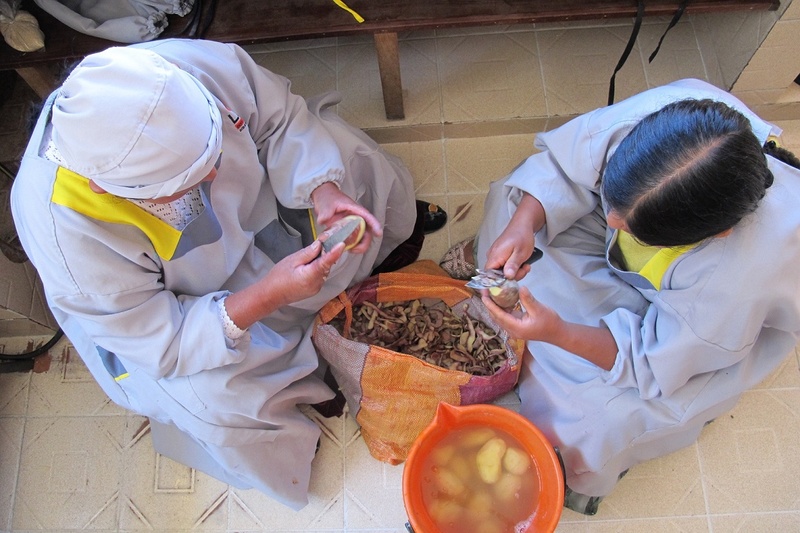 And, talk about the fastest potato peelers you’ve ever seen! 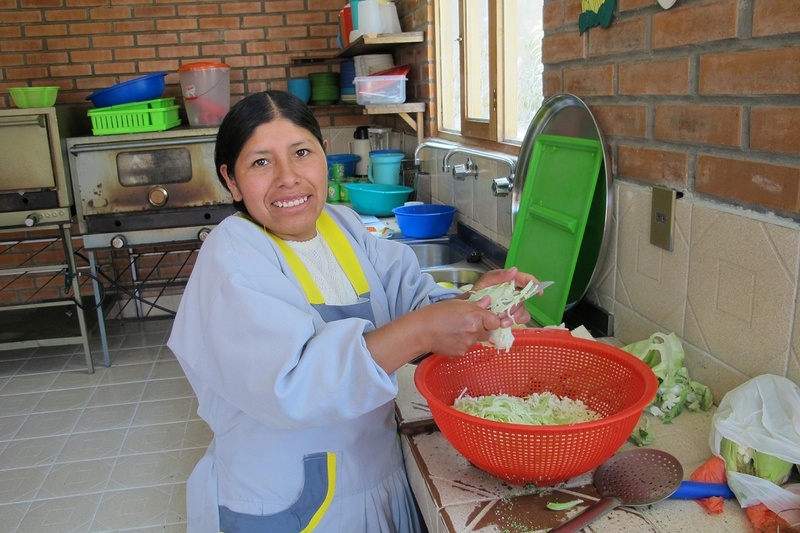 As we sat on little stools around a mound of potatoes needing to be peeled for that day’s segundo (main course), I decided that I was going to display my skill at peeling potatoes with a knife, rather than using a peeler. I mean, an ego can only take so much! So after I had peeled about 2 potatoes to their 12, Maxima quietly got up from her stool, dug around in the cupboard and with a respectful, but knowing look, passed me a potato peeler, most-likely left over from the last gringo kitchen volunteer, who, as it turns out, happened to be a chef from London! Loved this post! Thank you for sharing a bit of my country. Thanks for the most recent post on working in the kitchen with the knife wizards- great photos, and enjoyed the story. Look forward to the slide show! Meanwhile, thousands of kilometers to the North, finally some decent snow on the ground, and the lake has been frozen for weeks. Christmas cookies in the oven.